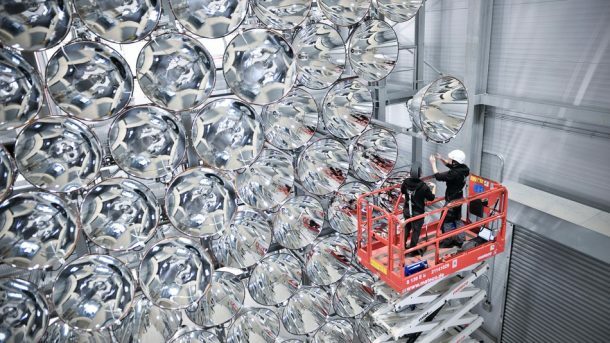 Do you fancy an artificial sun while suffering from the murky and cloudy days of winter? 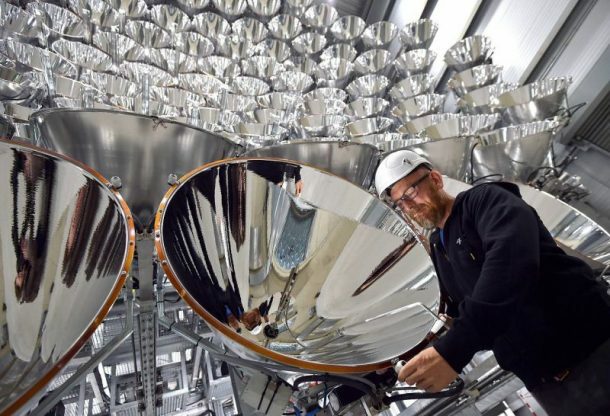 This massive lighting system built by German scientists might do the trick, as it claims to provide energy equivalent to the radiation of 10,000 Suns. 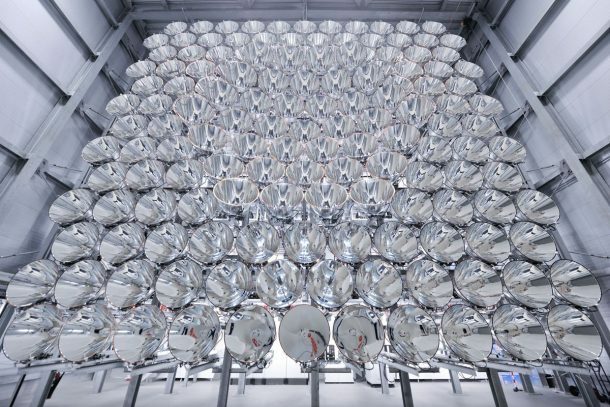 The “artificial sun” called Synlight has been built to study the environmental-friendly fuels by separating hydrogen atoms from water. 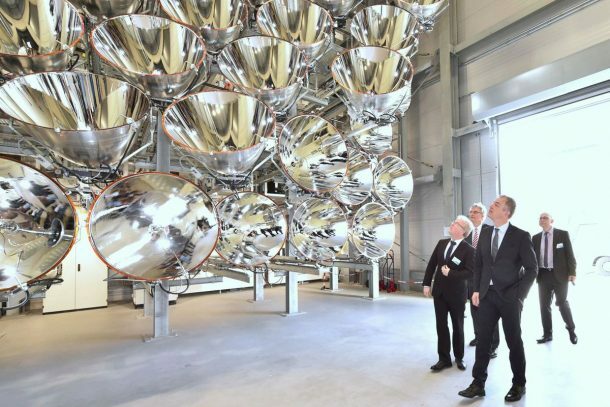 Synlight is created by German Aerospace Center (DLR) scientists in Juelich, about nine miles west of Cologne, Germany. The system is an array of 149 xenon short-arc lamps, which are similar to those used in the large cinema projectors. The 350-kilowatt honeycomb-shaped array was focused onto an 8×8 inch (20x20cm) metal sheet. According to DLR Director Bernhard Hoffschmidt, the temperature raised to about 5,432 degrees Fahrenheit (3,000 degrees Celsius). This massive structure measuring 45 feet in height and 52 feet in width will allow the researchers to test new ways of creating the ultimate clean fuel, hydrogen. Hydrogen is a much-coveted source of energy since it doesn’t produce carbon emissions while burning. However, creating the liquefied hydrogen requires complex procedures these days, such as harvesting solar energy to run large electrolysis plants. The power required to run such plants is much more than the power produced by them. The artificial sun’s radiation is focused on a single spot, which heats the metal sheet to 1,475 degrees Fahrenheit (800 degrees Celsius). The sheet is then sprayed with water vapors, where it reacts with water to separate oxygen and hydrogen. The oxygen oxidizes the metal, and we get free hydrogen atoms to be used as a fuel. Of course, the quirks of Synlight are quite evident; the first one being the dangers of interaction with the radiation since a single second of exposure would certainly burn a person to ashes. Secondly, the system consumes the same amount of electricity in four hours as an average household does in an entire year. This means that the Synlight can’t be practically used to create hydrogen. However, it is an exceptional effort to test the conditions and temperatures required to harvest sunlight in a more accurate and precise manner. As for now, the researchers are hoping to run a future version of the Synlight via actual sunlight, which is a confusing cycle though. But one has to trust it for the sake of a sustainable future.